Located at the edge of a small peninsula two miles from the Canadian border on the most northeastern shoreline of Vermont's Lake Champlain. Through the centuries northern Lake Champlain folklore describes a Loch Ness Monster-type creature nicknamed “Champ” that lives in the area. There have been numerous sightings by visitors and locals alike of some creature out in the lake. Nothing has ever been found. The French who constructed a stone windmill there once occupied the location where the current lighthouse was built. The area also played a part in the Revolutionary War on September of 1776, where then colonial General Benedict Arnold anchored his fleet prior to the Battle of Valcour Island. Although his fleet of Colonials suffered a loss, it delayed the British invasion long enough over the winter to allow the army to gain strength and defeat the British at Saratoga. Later, in the same area, the British ship Thunderer carrying sick and wounded soldiers defeated from the Battle of Saratoga, sank off the point as it crashed onto the rocks under the shallow waters. A lighthouse consisting of a lantern on a post was used at Windmill point as early as 1830. 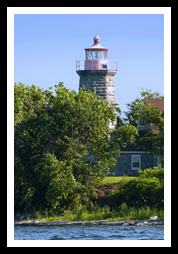 The Windmill Point lighthouse was built in 1858 to help guide mariners around the channel and islands of the northern portion of Lake Champlain. Together with the Isle La Motte Light, it forms a rough line marking the channel through the center of the lake. Windmill Point is the most northern lighthouse of all the Lake Champlain lighthouses, lying a mere two miles from the Canadian border. It marks the northern end of the lake and the entrance to the Richelieu River. 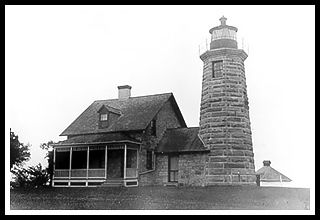 It became one of ten lighthouses originally established along Lake Champlain. In 1931, a skeletal tower replaced the tower, and the Customs Service in catching rumrunners during the prohibition period using the lighthouse property. In 1963, a local man named Lockwood “Lucky” Clark was walking around the property with his bride to be when the owner came out and asked him if we wanted to buy the property. Clark’s father had already purchased the Isle La Motte lighthouse nearby so he decided to purchase Windmill Point to keep both neighboring lighthouses in the family. In 2001, a Coast Guardsman, who visited the residence, decided to make a sincere effort to restore the original lighthouse, petitioning that it would be more cost effective to replace the light on the tower then to maintain the deteriorating skeletal tower. The lighthouse was relit in 2002, thanks to nearly 400 hours of investment by the Clarks to ready the structure. This rural area provides plenty of picturesque views of farmlands, forests, and wetlands. There are many biking and hiking trails groomed for locals and visitors alike to enjoy this quiet scenery. These trails also are used in the winter by cross country skiers and snowmobilers. Alburg Dunes State Park contains one of the longest beaches on Lake Champlain. If you enjoy golfing, you’ll find quiet places to golf at the Alburg Golf Links in the nearby mainland area. The Missisquoi National Refuge, north of Swanton, is an area where the Missisquoi River delta flows into Missisquoi Bay. 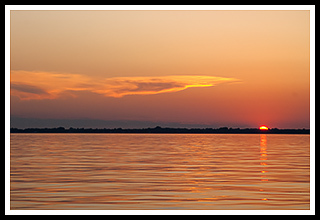 It’s loaded with many species of migratory birds, especially waterfowl, in the northern Lake Champlain section. The Alburg Recreational Rail Trail offers 3.5 miles of gravel pathway along the shores of Lake Champlain for bird watching, cross-country skiing, horseback riding, and mountain biking. 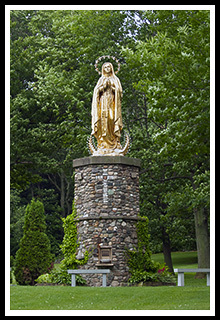 On the Isle La Motte nearby, there is a flat terrain bike trail called the Isle La Motte Ramble, a 10-mile biking trail that offers lake views, quiet roads, ancient rocks, and the famous Saint Anne’s Shrine, where the first known mass in Vermont was celebrated. The lighthouse is still best viewed by boat, as it is still a private residence and not open to the public. As access to the lighthouse is being contested in the courts, people are discouraged from trying to drive to the lighthouse. Views of the lighthouse can be seen from the New York shoreline near Rouses Point. Turn east onto Stony Point Road. Near the end of the road you will find a breakwater, which provides views of the lighthouse. 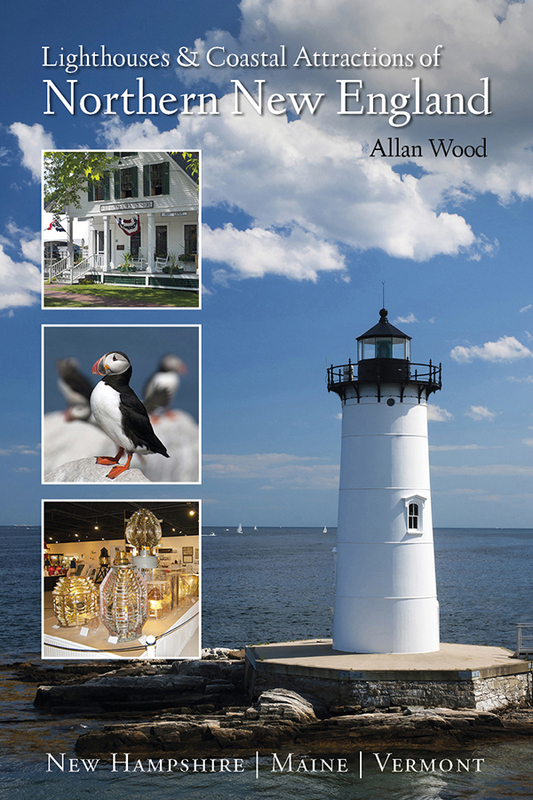 My 300-page book (with over 360 images), Lighthouses and Coastal Attractions of Northern New England: New Hampshire, Maine, and Vermont, contains stories from each of the 76 lighthouses in these states, along with plenty of coastal attractions and tours near each beacon.